An 80-year-old patient presented with right orbital mass. 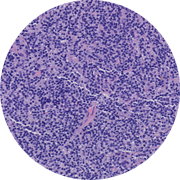 Histology sections show a lymphoma with a diffuse pattern. The lymphoma cells are composed predominantly of small lymphocytes with slight to more irregular nuclear contours. Some neoplastic cells have moderately abundant pale cytoplasm and it may represent monocytic differentiation. 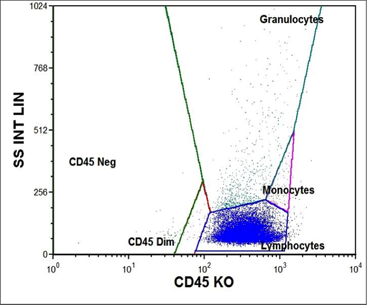 The concurrent flow cytometric analysis shows a monoclonal B-cell population expressing CD20 and kappa light chain. This monoclonal B-cell population is negative for CD5 and CD10. The overall findings are diagnostic of extranodal marginal zone B-cell lymphoma of mucosa associated lymphoid tissue (MALT lymphoma).